When I first started thinking about my capstone project, and creating a prototype for it, I wasn't sure where to begin. First of all, I used Coggle to create a mindmap. This was a very easy website to use. My driving questions is in the middle, and from there, you can see what other ideas branch out from it in regards to the project. I wanted to create a site where teachers can access many resources that entail reading and technology tools. See Coggle map above for more info. Teachers need to provide ample opportunities for students to read during the school day. Students can better retain information when they read silently. Students need to know how important reading skills are for their school success and beyond. Students become more engaged when there are opportunities to use technology tools. There are many online resources where students can read from. There are many tools where students can create projects after they read. Designing a logo was definitely a new experience for me. I had no idea where to start with this process. 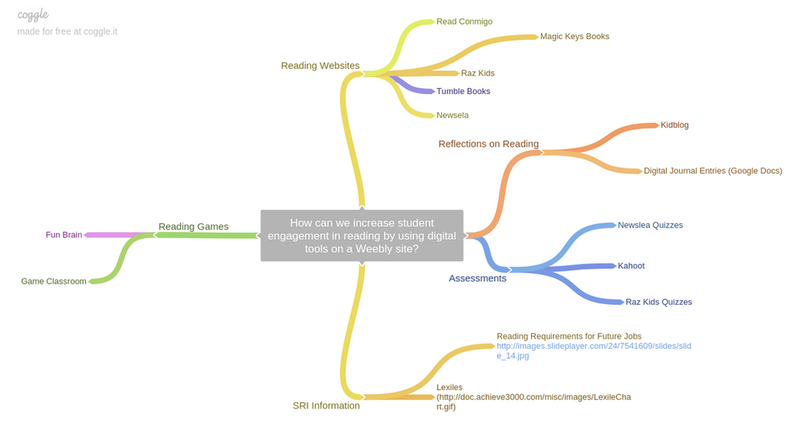 My big question of how to engage students in reading by the use of digital tools is all I had to work with. I knew that I wanted to incorporate a computer and a book. So I went to ﻿Logomakr a﻿nd searched for some images. The first picture below was my first attempt. I got helpful feedback from my amazing cohort and decided to not use a person falling asleep while reading. It sent the wrong message. So then I went back to the drawing board and came up with the second picture below. I wasn't too thriled with the colors and computer image that I came up with so I went back for a third attempt. Finally, I came up with the last and final product, third picture below. I felt like that logo depicted the right message: Engaging Students in Reading Using Digital Tools. The SITE Model of lesson design is one where the learner is not an isolated entity. It takes into account the different context of the learner such as the Sociocultural, Informational, Techhnical, and Educational background. Knowing where the learner comes from in all different areas is helpful when designing a lesson. 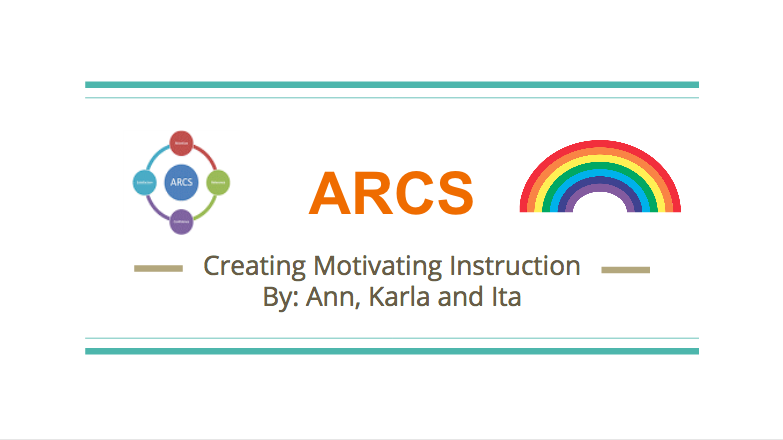 One of the instructional designs that I am familiar with and implement in my own classroom is the ARCS Model. For more information on this model, please click on the image below.